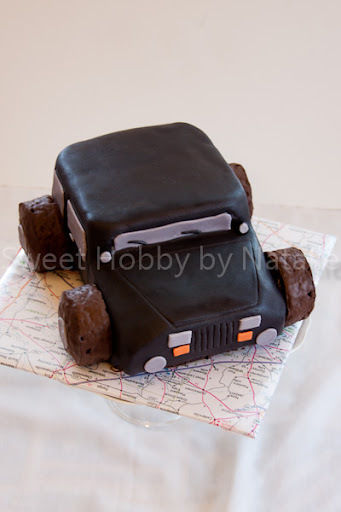 Sweet Shop Natalie: Pimp My Jeep! 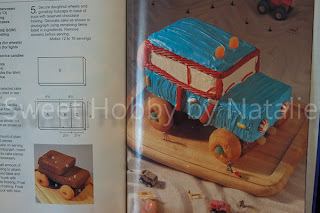 So in the last post I talked about the Baker's Cut-Up cake book. 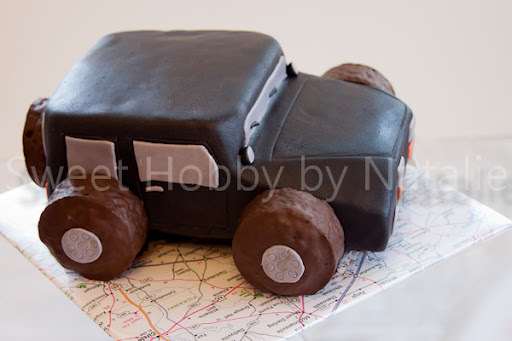 Well my kids like to look through it, and they were doing it one day and I saw this truck cake and I thought I would try to make it for my good friend Kelli for her birthday. She has a Jeep and she loves to go 4-wheeling. So this picture was my inspiration. I did not have the correct pan size it called for so I just made a 9x13 and made my cuts from that. 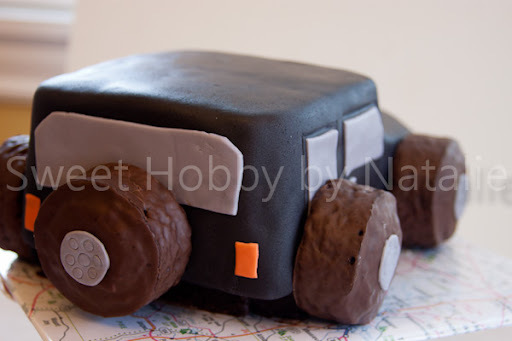 It turned out that it made a pimped out version of the Jeep! I used ding dong for the wheels to make it easier, they were a little too big, but the mini donuts were too small so the ding dongs kept up the pimped out look! 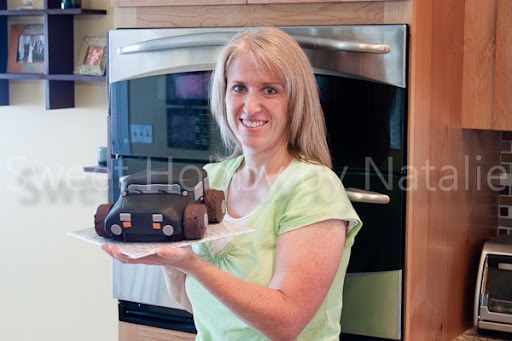 This also was my first time using ganache to cover the cake before covering it with fondant, and it worked out great. I was going to be out of town on Kelli's birthday so I decided I would make it early, and I invited her and my other friends over for a movie night and then surprised Kelli with the cake. I have known Kelli since 1998 when I was in college and needed a room to rent. I was looking through some wanted ads and found an ad that seemed good. When I called, Kelli answered and I told her I would like to come look at the house and room for rent. We set up a time and she said this to me. "If a girl named Trish answers the door just walk away!" I was wondering what the heck that was about, but went to the appointment anyway. I got there and Kelli answered the door and I took a tour of the house. I remember her showing me the whole house even her room and she had the whole The X-Files tv-series on video tape and that made me think she might be kind of a sci-fi geek. But I liked the place and felt good about living there. Kelli quickly became a great close friend and we hung out a lot. I moved back east for a year, and then we became room mates again and then even bought townhomes next to each other. Kelli is the kind of person that would do anything for you. She has a very caring heart, and does not think about herself first which has upset me at times. Many times I had told her she needs to not always say yes. I am sure she has been better at doing that, but still to this day even after I have moved away for many years, and we don't hang out like we used to, she is willing to help me out in anyway she can. Happy Birthday Kelli! Thanks for being a most spectacular friend this girl could ever have! Aw, thanks, Natalie! 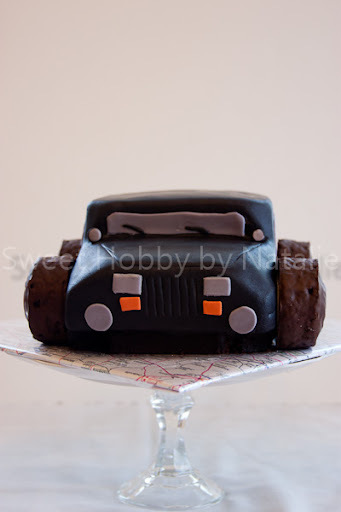 The cake was amazing. I brought leftovers to work and everyone was way impressed. Thanks so much for taking the time to do that. And thanks for being such a great friend! I love you! !